Reading this story requires you to willfully pay attention to the sentences and to tune out nearby conversations, the radio and other distractions. But if a fire alarm sounded, your attention would be involuntarily snatched away from the story to the blaring sound. "The simple example of having your reading interrupted by a fire alarm illustrates a fundamental aspect of attention: what ultimately reaches our awareness and guides our behavior depends on the interaction between goal-directed and stimulus-driven attention. For coherent behavior to emerge, you need these two forms of attention to be coordinated," René Marois, associate professor of psychology and co-author of the new study, said. "We found a brain area, the inferior frontal junction, that may play a primary role in coordinating these two forms of attention." "We wanted to understand what caused limitations in our conscious perception when we are surprised," Christopher Asplund, a graduate student in the Department of Psychology and primary author of the new study, said. "We found that when shown a surprise stimulus, we are temporarily blinded to subsequent events." In their study, the research team asked individuals to detect the letter "X" in a stream of letters appearing on a screen while their brain activity was being monitored using functional magnetic resonance imaging, or fMRI. Occasionally, an image of a face would unexpectedly interrupt the stream. The surprise caused the subject to completely miss the "X" the first couple of times, despite the fact they were staring directly at the part of the screen on which it appeared. They were eventually able to identify it as successfully as when there was no surprise. "What we think might be happening is that this brain area is coordinating different attention systems - it has a response both when you are controlling your attention and when you feel as though your attention is jerked away," Asplund said. "What we show is the dark side or negative impact of the orienting response. We found it blinds you to other events that can occur soon after the presentation of the surprise stimulus," Marois said. "The idea is that we can't attend to everything at once," Asplund said. "It seems that the inferior frontal junction is involved in this limitation in attention." The new research supports previous work by Marois' laboratory that found the interior frontal junction plays the role of an attentional bottleneck - limiting our ability to multitask and attend to many things at once. "These new findings and our previous findings suggest that this area is centrally involved in the control of attention and may limit our attentional capacities," Marois said. "It is a very exciting convergence of findings across our studies. We're conducting studies now to demonstrate whether in fact disruption of activity in this brain region leads to loss of control of attention." 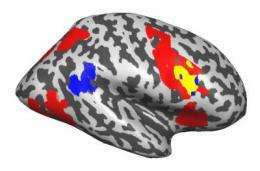 The usage of surprising moment belongs to well known tricks of thieves even without fMRI.. When a link exists to the paper discussed, why is it not included? Would it put off readers to know that the paper discussed is "A central role for the lateral prefrontal cortex in goal-directed and stimulus-driven attention" Christopher L Asplund, J Jay Todd1, Andy P Snyder & René Marois Nature Neuroscience advance online publication and that doi:10.1038/nn.2509 links to an informative abstract (too long to cut and paste here)?